Ready for some rib-tickling fun? Leroy Troy, the consummate smooth-talking, banjo-clawing star of the Marty Stuart Show on RFD Network, will perform March 23 during the first year anniversary celebration at Short Mountain Distillery. Troy's namesake mule, "Leroy," is another scheduled headliner for the event, from the ranks of Middle Tennessee Mule Skinners, with international headquarters located in nearby Woodbury. The event, billed as a “One Year Anniversary Hootenanny,” runs from 9 a.m. to 4 p.m. Saturday, March 23. In addition to the Tennessee Mafia Jug Band, The Jimalong Josies and other musicans will be performing. "I'm honored to on the same performing card with Leroy, the famous mule that belongs to Smyrna, Tenn., 'Mule Skinner' Danny Fraley," noted singer/banjo plucker Leroy Troy. "It's no small honor to have a prized mule named after me." And the mule is reportedly honored to share "top-billing" with entertainer Troy. "My mules 'Leroy' and 'Lucky' comprise my most prized wagon-pulling team that will be giving children and adult free rides on March 23rd, a Saturday," testified mule man Fraley. "Leroy (the mule) always struts and puts on extra when he performs alongside Leroy Troy, the acknowledged star on the Marty Stuart Show." Leroy, the musician, explained that he will be performing as part of the Tennessee Mafia Jug Band, and how the band came to be named. "Back in the 1990s, while appearing in New York, a disc jockey named Bill Knowles came up with the name, 'Tennessee Mafia Jug Band,'" Leroy shared. "It has a nice catchy ring to it, we kept the name. "And I think me and the Jug Band hold the record for most appearances at the Arts Center of Cannon County. We're really honored to be asked back to appear at the Short Mountain Distillery too," the entertainer added. "We've appeared throughout the U.S., but never played Albuquerque, New Mexico," Leroy qualified. "Once we play Albuquerque, I guess you can truthfully say we're nationally known…"
A free sip of clear moonshine product will be available to adults along with free mule rides, food by the Blue Porch Cafe and the Hazzard Life Cars will also be on display. "We'll give out free sips and sample of our product, which can be purchased in our beautifully-designed bottles that day" added Distillery Director of Hospitality John Whittemore. "We'll also have 'Moonshine Cookies'available from the famous Blue Porch Restaurant located in the Arts Center. The restaurant will be serving food throughout the day." Since starting the manufacturing of legal moon shine in 2012, the product is now being sold in all regions of the state, including East, Middle and West Tennessee, Whittemore confirmed. Legendary Cannon County businessman Bill Smith is expected to bring his mules to Short Mountain. "Woodbury retired banker Bill Smith, age 94, is perhaps the most famous of the Mule Skinners invited to bring his mules up on the mountain that day," confirmed Fraley. 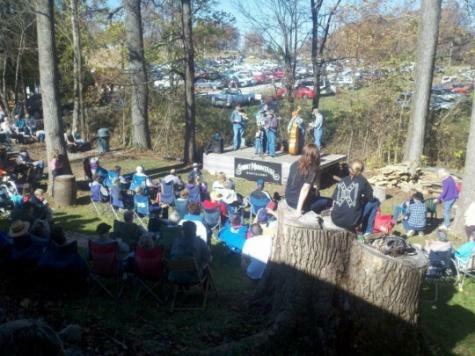 There's another big Mule Skinner's event coming in May. Mule Skinners have cultivated their annual May 11 showcase event in Woodbury into being the largest "One Day Mule Show In the Southeast," proclaimed Mule Skinner president Andy Duggins of Woodbury. Founding MTMS member Smith, owner of Woodbury's Smith Funeral Home, can't recall his first mule show, "but my love for mules goes back to my youth when mules were a big industry in Cannon County." "I was born on a 300-acre farm, where my father, grandfather and three sharecropping families all farmed with mules," noted Smith, in reconstructing his mule trail back in time. "Mules have a lot of heritage here, including Uncle Dave Macon's Freight business in the 1920s before he became a star on WSM Radio and the Grand Ole Opry." Plus, Uncle Dave was reputed to be a regular customer and consumer of some of the best (then illegal) "moon shine" ever produced on Short Mountain back in the 1920s-era. Woodbury Mayor Harold Patrick credits the Short Mountain Distillery and Mule Skinners with triggering new tourism dollars into his community's economy. "Distillery folks and the Mule Skinners have both been showcased on statewide and national TV, plus innumerable newspaper and magazine articles," Patrick credited. "They're a big help in bringing tourism dollars into our local economy." Legends from Short Mountain have never been in short supply, including gangster Al Capone, as the most infamous buyer of Short Mountain moon shine back in the Prohibition-era of the 1920s. Legend has it that Capone arranged for Short Mountain 'shine to be shipped to Chicago, and marketed under the label of "City Rum." Since the Distillery and Short Mountain, along with the Arts Center are bringing so much tourism attention to our beloved Cannon County, why not establish a "Mule Skinners' Museum" alongside the Distillery, showing the mules' heritage and importance to our present-day way-of-life...just to kick up an idea maybe worth thinking about!!? ?